Notebooking and lapbooking are closely related. Notebooking is a bit simpler, with the information inserted into simple 3-ring binders instead of put into the more elaborate lapbooks. Notebooks are put together using maps, lab reports, scrapbook pages, worksheet pages, drawings, essays, timelines, and any other relevant work that your child creates. The sites below will guide you through the process of starting to notebook and give you some examples and ideas. “From copywork to nature study, notebooking is a fun tool that captures all that we have learned about a particular topic and turns it into a concise, artful piece of work. The kids are always excited to share their notebooks with others & they love to look back over what they’ve created (& learned)… Whether starting with a well-planned, formatted notebooking page or a single piece of blank paper and a few supplies, each notebooking page becomes a dearly treasured & unique creation.” NotebookingPages has both free resources and downloads for sale. You can see a demo of their cool Notebooking Publisher app (free for Notebooking Pages Lifetime Treasury Members) in the videos below. There are a variety of one-page themed downloads for your notebooks at this site: math, planets, scientific method, science biography, animals, music, and more. 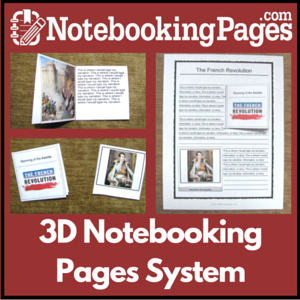 Donna Young’s Notebooking – Donna has an extensive site full of downloads and most of her notebooking pages are attractive, basic templates that can be used for any subject. The Notebooking Fairy – An extensive site with many free downloads on many subjects as well and encouraging blog posts and ideas and the Notebooking Success eBook. This is an excellent article from Terri Camp of Ignite the Fire that gives the basics of notebooking. Tamra of Highland Heritage not only has some of the best downloads for notebooking, she also has this page detailing the basics of how to get started. Homeschooling with Journals – Journals can be used for anything explored in learning. Instead of preprinted templates, students enter all of their own content.